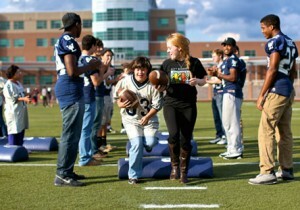 Best Buddies Leadership Development programs represents one of our organization’s three key mission pillars. The programs educate and empower people with and without IDD to become leaders, public speakers and advocates. Best Buddies passionately believes that its program participants can lead the effort within their community and beyond to build a more inclusive world for people with IDD. Offers people with and without IDD the opportunity to gain the public speaking skills, self-esteem and confidence needed to successfully advocate for themselves, their peers and Best Buddies in communities, workplaces and government. 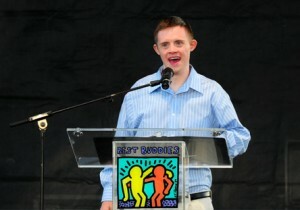 Empowers youth to become advocates for people with IDD and help open new Best Buddies chapters and programs by organizing special events that promote awareness to the disability rights movement. When a Best Buddies participant joins the Ambassador program, they enter into a series of group and private training in speech writing and public and conversational speaking to become advocates for themselves and the disability rights movement. Once trained, Ambassadors work with Best Buddies staff to identify public speaking opportunities in their local community, where they can share their personal stories with Best Buddies chapters, businesses, legislators, interest groups and donors. Each Ambassador is paired with a speech coach, who helps them brainstorm, organize, write, edit and practice a speech and provides one-on-one attention as needed. Throughout their participation in the program, Ambassadors have access to a variety of ongoing advocacy trainings led by Best Buddies staff. As Ambassadors gain advocacy experience in conversational and public speaking, they have the opportunity to grow into a State or Global Ambassador where they may be invited to speak nationally or internationally on behalf of Best Buddies. Students attending a school without a special education program can join a Promoters chapter to develop connections with people with IDD, or can start one by contacting their local Best Buddies state office. Each Promoters chapter is led by a President from the student body and a Faculty Advisor, and is assigned a Best Buddies staff person who offers regular support and guidance. Once formed, Promoters chapters host events, activities, fundraisers and assemblies where they advocate for people with IDD, educate the public about inclusion and promote the ideals of the Best Buddies mission. Throughout the school year, Best Buddies encourages all Promoters chapters to host as many activities as possible (minimum of 4) on and off campus that are inclusive of people with IDD.